Brazillian gangsters armed with assault rifles attacked a convoy of trucks carrying nuclear fuel in Southern Brazil earlier this week, according to police reports. The convoy left the headquarters of Indústrias Nucleares de Brasil in Resend around 6:20 am Tuesday and headed towards the Angra Nuclear Power Plant located at the Central Nuclear Almirante Álvaro Alberto on the Itaorna Beach in Angra dos Reis, Rio de Janeiro, Brazil. Within the convoy, there were two specialized trucks hauling uranium pellets were escorted by the Federal Highway Police and vehicles of the State Environmental Institute. According to Brazil’s O Globo newspaper, the convoy was peppered by heavy fire two miles north of the power plant. The Brazilian Federal Highway Police said in a statement that its vehicles were escorting the nuclear fuel convoy when the attack occurred. Law enforcement returned fire, which developed into a fierce shootout. The statement from authorities said attackers retreated when law enforcement personnel returned fire. The convoy arrived at its final destination [nuclear power plant] without further incident 20 minutes following the attack. 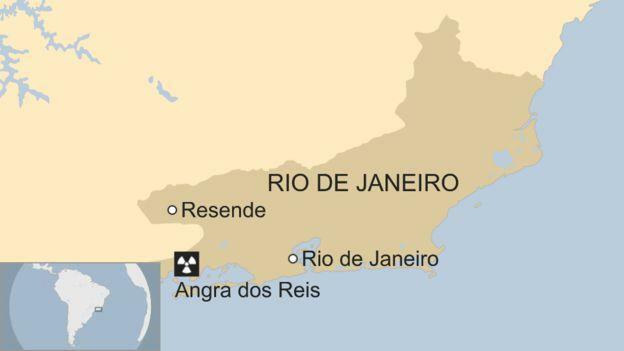 The mayor of Angra dos Reis, Fernando Jordão, asked the governor of Rio, Wilson Witzel, for additional security around the nuclear power plant following the attack. "I told the governor that we need to make a security plan for the region, since we have nuclear power plants here. It's a sensitive area. The governor stopped talking with the federal government and revealed that he will seek the Minister Sergio Moro, Justice and Public Security - said the mayor. In a statement, after the incident, Eletronuclear revealed that the nuclear cargo was at risk: "If a gunshot was able to cross the protection of the container, it could damage the nuclear fuel, but this would not endanger the population or the environment because the fuel is in the natural state." Violence has erupted in Angra dos Reis in recent years, and heavily armed criminals now roam the highways near the power plant. Whether the attackers had intended to steal the nuclear fuel has yet to be determined. Law enforcement is now trying to figure out the motive behind the incident.